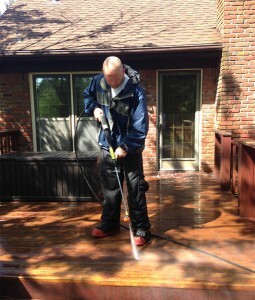 If your deck is starting to look faded or dull, our professional team can power wash the wood surfaces on your deck to remove all the old stain, paint and/or sealer. Our team of professionals will keep your deck in great condition without damaging the wood. Nate’s Painting is a trusted member of the BBB with an A+ rating! In addition to pressure washing decks to remove old stains we also provide power washing services for the exterior of your house as well as the concrete areas. If your pavement is dirty we can help you get a newer clean look with our services. Our professional team can pressure wash your siding, concrete, pavement, asphalt, brick, stone, roofing as well as gutters. Contact us today to find out more and to get your free quote!